thanks so much, you know i appreciate that a lot coming from you! I am not familiar with this artist, Alicia, but that is of little importance when it comes to what I think about your portrait of her. I think this composition is excellent. I like how you have handled the colors in her gown. They are subdued, so they do not detract from her face. The light tones and dark tones in this drawing, are perfect. Well done. You are very welcome. I really like this portrait. 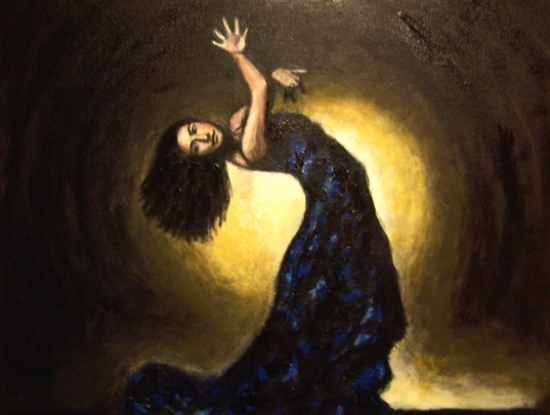 The dancer's pose and the colors you chose for presenting her, make for a dramatic artwork. Thanks again! I think Flamenco is a nice and powerful subject. After comments as kind as yours I´ll try again! merci jfm, it is really a pleasure for me to around great artists like yourself! Me gustan mucho las 3 últimas telas que salen del ordinario. Mi enhorabuena, son muy expresivas! Gracias Conus! una de las cosas que mas aprecio en una pintura es la expresividad y trato de hacer cosas diferentes, asi que muchas gracias por tu amable comentario! This is another perfect portrait Alicia!!!! thanks so much rosemary! i really like your gallery! Oh thanks aloooot Alicia So happy cos you like my gallery I really appreciate ur opinion as u r sooooo talented dear!!!! you are welcome! let´s keep up our art! Wow, great painting! Stunning background! Excellent portrait! Bravo!! Muy Bonita! thanks so much! you are very kind! i plan to post soon some more Flamenco pics, i´ll let you know! new Flamenco pics online! i hope you also like them! Wow, this is really original and beautiful! Excellent work! Love the movement and the background's kinda magic with the glowing light. thanks so much! i m so happy you like it! i have just visited your gallery and i like it a lot! have a great weekend! YOU'RE WELLCOME and THANKS for liking my works. (comments??) You too have a great wekend. as a general comment, i think your style is great and you had a good technique. I can see you love what you do, which is the best!! keep on great work! THANKS A LOT!!! I sure love to paint and draw and I'm glad the love shines through!!! i m happy to hear that!